Millions upon millions of custom screen printed t-shirts are made each year, but few suppliers are devoted to them as much as we are. You can choose from an outstanding selection of shirts when you make personalized t-shirts and tank tops at Shop4teams. Dedicated to bringing you quality, Shop4teams helps you bring out your creativity and innovation. For more than 30 years, we have aspired for a higher level of excellence, and we are confident you will get just that that every time you slip on your new custom screen-printed team t-shirt. Make Shop4teams is your #1 source for short or long sleeve tees, tank tops, raglans, or ringers. Each one is designed for long wear and easy care. Our shirts feature the ultimate in personalized comfort. Get moving in tees with roomy fits or athletic cuts, and take advantage of moisture control materials. We give you an incredible array of colors, sizes and styles. We have the latest shirts for maximum mobility, and our sleeveless tees keep you cooler. Create personalized tanks and tees for work and play. You can also pair your personalized adult t-shirts with custom shorts or pants. Make your own original shirts to support your school, team, organization, event, or business. Or simply create a shirt that’s just for your club! 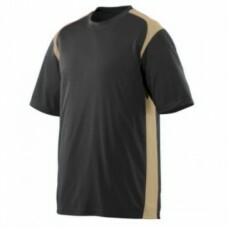 Add your name, a team name, logo and number to your team t-shirt. With endless design possibilities, you’ll want to make a shirt for all of your activities. Our t-shirt selection includes amazing performance fabrics and ultra soft cottons. We work closely with you to make sure the custom screenprinted t-shirts you receive are exactly the custom t-shirts you envisioned. From every fine line in the lettering and logo to the type of shirt, Shop4teams aims for pure perfection in every custom t-shirt we produce. We wouldn’t have it any other way. At Shop4teams, we bring our A-game! Size chart 100% polyester wicking smooth knit. Odor resistant. Wicks moisture away from the bod.. Size chart 50% polyester/50% cotton jersey kn it. Contrast color 1x1 rib knit V-neck collar. Contras.. Size chart Self-fabric collar Badger spo..